Just4Keepers Goalkeeper Academy will again be holding our annual Easter Camps in Dublin, Goalkeeping Easter Camps 2016 is set to again have record numbers. 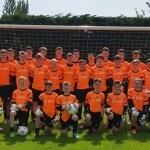 Last years Goalkeeper East Camp sold out 3 weeks before the dates. All Coaches for this Soccer Easter Camp will be ex and current Professional Goalkeepers. This years Goalie Easter Camps will be held in DCU (Glasnevin) & Clondalkin. This year we have added an Advanced Goalkeeper Camp where Goalkeepers aged 13plus will train with not only Goalkeeper Coaches but Strength & Conditioning coaches to work on speed, spring, and agility. We will also host our usual camps for Keepers aged 7plus, check out below all that will be happening at the best Goalkeeper Camps in Dublin. REMEMBER: At every Just4Keepers Goalkeeper Camp EVERY Goalkeeper ALWAYS receives a FREE pair of Just4Keepers Goalkeeper Gloves.